The city is constantly trying to innovate to improve its traffic signals particularly for multi-modal transportation that has been neglected by the engineering profession. I have written about this before, but this time the City has spent a little effort with Portland State to learn more about the subject. Question: Why can't the traffic signal detect me when I am on a bike? This answer wouldn't meet expectations in Portland. How about instead of say near the center of the lane, why not make it more conspicuous by adding green color to the existing bike signal detection stencil applied. 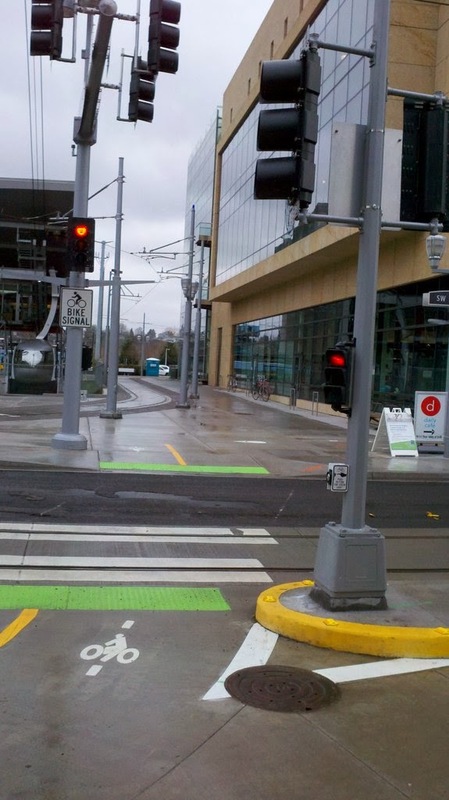 The hope is that this touch of green would improve the understanding of cyclists at the intersection and results in improved compliance with the traffic signal and better positioning in the intersection whether it be in a bike lane or in a shared Travel Lane . Feedback on Twitter was mostly positive. I had one traffic engineer that suggested the contrast might reduce the visibility. That's the great thing about Twitter is it gives us some quick feedback on a concept and then we can build some of those thoughts into the study design and test the subject to determine whether they agree with the expert who made that particular comment. The beauty of this particular study is that it was completed by a student who needed a project to complete his degree. So, the cost to the city in this case is the materials and labor associated with installing the experimental markings and the staff time to investigate and review the work of the research team. So, the results? Published on the Portland State website here.